The United Nations Volunteers (UNV) programme is a United Nations organization that contributes to peace and development through volunteerism worldwide. Based in Bonn, Germany, UNV is active in around 130 countries every year. UNV, with Field Units in 86 countries, is represented worldwide through the offices of the United Nations Development Programme (UNDP) and reports to the UNDP Executive Board. In 1962, the US Peace Corps convened the International Conference on Middle Level Manpower in Puerto Rico, where the role of international volunteers helping to build skills in developing countries was promoted. As a result, the International Peace Corps Secretariat, later the International Secretariat for Volunteer Service (ISVS), was created as a global organization to promote volunteer services for development around the world. A United Nations Volunteers initiative was proposed in a speech at Harvard University on June 13, 1968 by Shah Mohammad Reza Pahlavi and UNV was established 1970 by the UN General Assembly. ISVS became instrumental in the establishment of UNV and was itself dissolved in 1976. UNV is administered by the United Nations Development Programme (UNDP). UNV was originally headquartered in Geneva, Switzerland. In 1996, the headquarters moved to Bonn, Germany, specifically to Haus Carstanjen. UNV headquarters moved to the former offices of the German Parliament in 2007. UNV has liaison offices in Tokyo and New York City and representatives in more than 50 programme countries. UNV directly mobilizes more than 7,700 people as UN Volunteers every year nationally and internationally, with 80 per cent coming from developing countries, and more than 30 per cent volunteering within their own countries. UN Volunteers receive a Volunteer Living Allowance (VLA), a financial allowance intended to cover basic living expenses each month. The minimum age for UN Volunteers is 25 years. There is no upper age limit. UN Volunteers help to organize and run local and national elections and support a large number of peacekeeping and humanitarian projects. UN Volunteers comprise one third of all international civilians working in UN peacekeeping operations. With the UNV programme, individuals can volunteer in their own country (national volunteers), in a country different from their country of origin (international volunteers), or through the Internet (online volunteers). In addition, UNV operates the Online Volunteering Service, a web-based virtual volunteering platform for non-governmental organizations (NGOs) or other civil society organizations, governments or other public institutions, United Nations agencies or other intergovernmental institution to involve online volunteers in various projects. The service was launched in 2000 as a part of NetAid, which hosted and co-managed the service until 2005. The service operates in English, French and Spanish. In 2014, all 16,134 online volunteering assignments offered by development organizations through the Online Volunteering service attracted applications from numerous qualified volunteers. About 60 percent of the 10,887 online volunteers were women, and 60 percent came from developing countries. An evaluation of the UNV Online Volunteering service assessed the service’s impact on organizations, beneficiaries and UNV, as well as on the UN Online Volunteers themselves. The 2014 evaluation found that the service has played a unique role in expanding and mainstreaming online volunteerism globally, and is highly appreciated by organizations and volunteers. Online volunteers mobilized through the Online Volunteering service are volunteers for the organization with which they collaborate. Online Volunteers do not follow the same conditions of service than UN Volunteers e.g. they do not receive a contract from UNV as such, and do not receive a VLA. Since 2012, integrating volunteerism into discussions around the post-2015 development agenda has been a priority for UNV. In 2014, UNV focused on supporting the second round of UNDG dialogues on implementation of the post-2015 development agenda. The dialogues were framed around six themes: localizing the post-2015 development agenda, helping to strengthen capacities and build effective institutions, participatory monitoring for accountability, partnerships with civil society, engaging with the private sector, and culture and development. UNV co-led the dialogues on partnerships with civil society and was strongly engaged in the dialogues on participatory monitoring for accountability. Field Units and Post-2015 International UN Youth Volunteers supported all six dialogues in several countries, contributing to and conducting local, national and global events and workshops to ensure stakeholders’ voices were heard, good practices shared and concrete opportunities identified. To achieve the Sustainable Development Goals (SDGs), people’s engagement in planning, implementation and monitoring needs to be facilitated and new partnerships forged. Volunteers will be instrumental in this process. This has strongly emerged from an extensive consultation process led by the UN, which has involved over 8 million people, and was summarized as follows by the UN Secretary-General in his Synthesis Report on the post-2015 sustainable development agenda: “As we seek to build capacities and to help the new agenda to take root, volunteerism can be another powerful and cross-cutting means of implementation. Volunteerism can help to expand and mobilize constituencies, and to engage people in national planning and implementation for the Sustainable Development Goals. And volunteer groups can help to localize the new agenda by providing new spaces of interaction between governments and people for concrete and scalable actions.” At the seventieth session of the UN General Assembly, the Secretary-General presented a proposed Plan of Action for the next decade and beyond (2016-2030). This plan aims at integrating volunteering in peace and development policies and programmes through a strategic and collective long-term approach that matches the period of SDG implementation. In 2012 UNV launched the Volunteer Action Counts campaign to tell the world about the impact of volunteering by documenting the actions of volunteers across the globe. Over 64 million actions were counted by the time the Rio+20 summit took place — a "remarkable testament to bottom-up, grassroots commitment" yet one more demonstration of how Rio+20 is mobilizing a global movement for change, as UN Secretary-General, Mr Ban Ki-moon, said to the United Nations General Assembly in 2012. The Volunteer Action Counts website and social media profiles continue to gather stories about volunteering and provide information about upcoming events, opportunities and best practices. Likewise, through the Online Volunteering service newsletter, UNV showcases experiences, best practices and lessons learned about volunteering via the Internet from organizations and volunteers worldwide. UNV celebrates International Volunteer Day on 5 December every year. On the same day, the winners of the global Online Volunteering Award are announced. The Award is presented annually since 2000 to teams of online volunteers for their contributions towards the achievement of the Sustainable Development Goals (SDGs) through the Internet. A jury made up of external experts in volunteerism and development cooperation as well as United Nations Volunteers (UNV) representatives selects the winners. The Award presents an opportunity for both, online volunteers and organizations, to bring their online volunteering experiences and good practices to the attention of a global audience. In the run up to International Volunteer Day (IVD), anyone can vote for their favourite winners on the online volunteering service website. The team that gets the most votes is announced as the public’s favourite on 5 December. All Stories are featured on the website, they illustrate the impact online volunteers have on the work of development organizations and convey how organizations express their appreciation to their volunteers for a successful online collaboration. UNV also operates the World Volunteer Web, a web site to promote volunteerism globally, which was originally created to support the International Year of Volunteers in 2001. UNV was the focal point for the International Year of Volunteers in 2001, and also for International Year of Volunteers Plus 10 marked in 2011. Every three years UNV produces the State of the World’s Volunteerism Report, a flagship UN publication designed to strengthen understanding on volunteerism and demonstrate its universality, scope and reach in the twenty-first century. 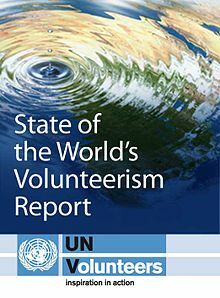 The first State of the World’s Volunteerism Report by the United Nations Volunteers (UNV) programme was launched at the United Nations General Assembly in New York, United States, on 5 December 2011 and about 80 countries around the world. The report examined important contributions in diverse fields such as sustainable livelihoods, social inclusion, social cohesion and disaster risk reduction. By suggesting how volunteerism can be taken forward, the SWVR also provides an alternative vision of a better society. The second State of the World's Volunteerism Report – Transforming Governance was launched in June 2015. It is a "review of the power of volunteer voices to help improve the way people are governed. Drawing on evidence from countries as diverse as Brazil, Kenya, Lebanon and Bangladesh, the UN report shows how ordinary people are volunteering their time, energies and skills to improve the way they are governed and engaged at local, national and global levels. Better governance at every level is a pre-requisite for the success of the new set of targets for future international development, the Sustainable Development Goals". The 2018 State of the World's Volunteerism Report The thread that binds was launched on 18 July 2018 during the 2018 High Level Political Forum in New York, United States. The report presents new evidence on the role of volunteerism in strengthening community resilience. It finds that communities value volunteerism because it enables them to create collective strategies for dealing with diverse economic, social and environmental challenges. At the same time, unless appropriately supported by wider actors, volunteering can be exclusive and burdensome for some groups. The report thus explores how governments and development actors can best engage with volunteerism to nurture its most beneficial characteristics, while mitigating against potential harms to the most vulnerable. In doing so, the report provides an important contribution to the evidence base on inclusive, citizen-led approaches to resilience-building. ^ "Ministry Paper No. 60" (PDF). National Library of Jamaica. ^ Lough, Benjamin J. "The Evolution of International Volunteering" (PDF). ^ "Speech Shah Mohammad Reza Pahlavi at Harvard University" (PDF). harvardmag.com. ^ "Story Map Journal". arcgis.com. Retrieved 12 April 2018. ^ "Frequenlty Asked Questions on how to volunteer onsite". unv.org. Archived from the original on 15 June 2016. Retrieved 12 April 2018. ^ "United Nations Volunteers". unv.org. Archived from the original on 31 May 2016. Retrieved 12 April 2018. ^ "Home - UNV Online Volunteering service". www.onlinevolunteering.org. Retrieved 12 April 2018. ^ "UNV's Online Volunteering service has received a financial contribution from the Federal Public Service (FPS) Foreign Affairs, Foreign Trade and Development Cooperation of the Kingdom of Belgium to support the outreach to the francophone world". onlinevolunteering.org. Archived from the original on 1 April 2016. Retrieved 12 April 2018. ^ "As part of the long-standing partnership of UNV with the Spanish Agency for International Development Cooperation (AECID), the Online Volunteering service has received a financial contribution from AECID to support the outreach to the hispanophone world". onlinevolunteering.org. Archived from the original on 28 March 2016. Retrieved 12 April 2018. ^ "UN Volunteers". www.unv.org. Retrieved 12 April 2018. ^ "UN Resolution: Integrating volunteering into peace and development - the plan of action for the next decade and beyond". unv.org. Archived from the original on 9 October 2016. Retrieved 12 April 2018. ^ "About Volunteer Action Counts". volunteeractioncounts.org. ^ "Home - UNV Online Volunteering service". onlinevolunteering.org. Retrieved 12 April 2018. ^ "UNV Online Volunteering service". Onlinevolunteering.org. Retrieved 2012-10-21. ^ a b "SWVR 2015". volunteeractioncounts.org.